Item #JP-CA-3: 9" - 10" long Crystallized Calcite Alligators. Bodies are carved from Natural Calcite in shades of light to dark Gray, backs and the tops of tails are covered with rough Yellow Calcite Crystals. 2.5-4.4 lbs. each. Item #GS-575: 5"x2.5" tall Orange and Cream Calcite Fish. Item #JP-CA-2: 12"-14" long Crystallized Calcite Alligator. Bodies are carved from Natural Calcite in shades of light to dark Gray, backs and the tops of tails are covered with rough Yellow Calcite Crystals. 3-5 lbs. each. 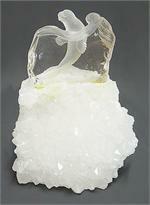 Item #GS-710: 3 1/2" x 2 1/4" x 3 1/2" tall Calcite base with 2 1/4" x 1/2" x 2" tall internally carved Quartz Seal.